Writing a love letter goes hand in hand with the separation of lovers. This could be a long separation – weeks, months or years, as experienced by countless lovers divided by war. Or it could be just a short period of time – days or hours, that the couple fills by writing letters. 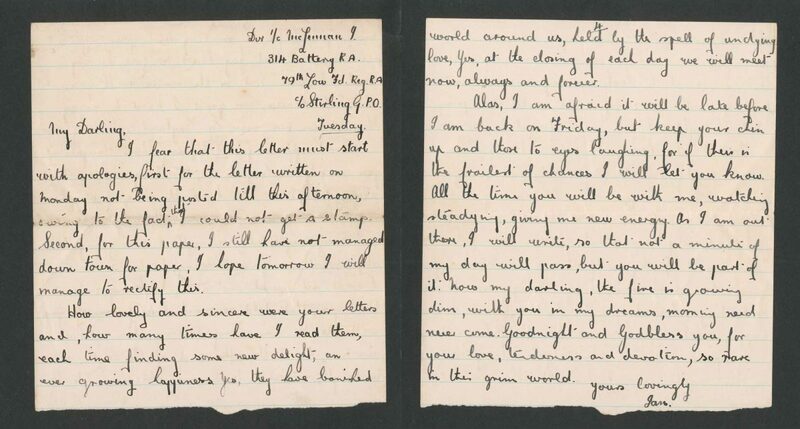 Our collection of love letters spans over 100 years. Here we look at three couples who used the post to express their feelings. 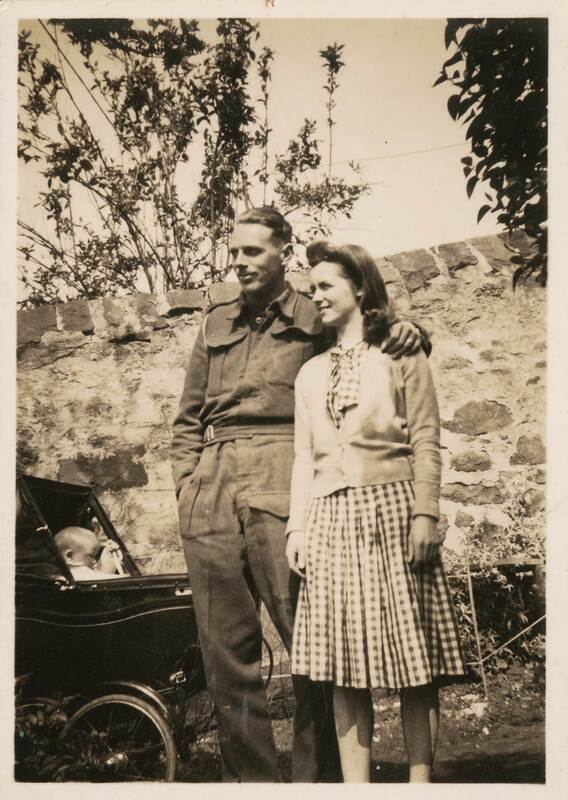 Ian McLennan wrote to Joan Walker during their early courtship and then during their separation after their marriage, when he left for military service. Ian’s love letters connect the couple across the distance that divided them. Ian asked Joan to think of him at midnight every day so that ‘at the closing of each day we will meet now, always and forever’. 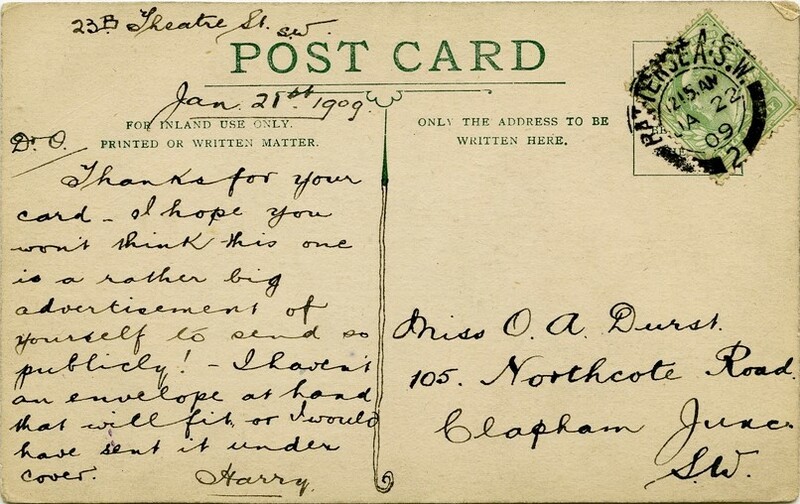 We look after a group of 33 postcards, hand illustrated by Harry Daniels and sent to his future wife Olive Durst during their courtship, between 1907 and 1911. 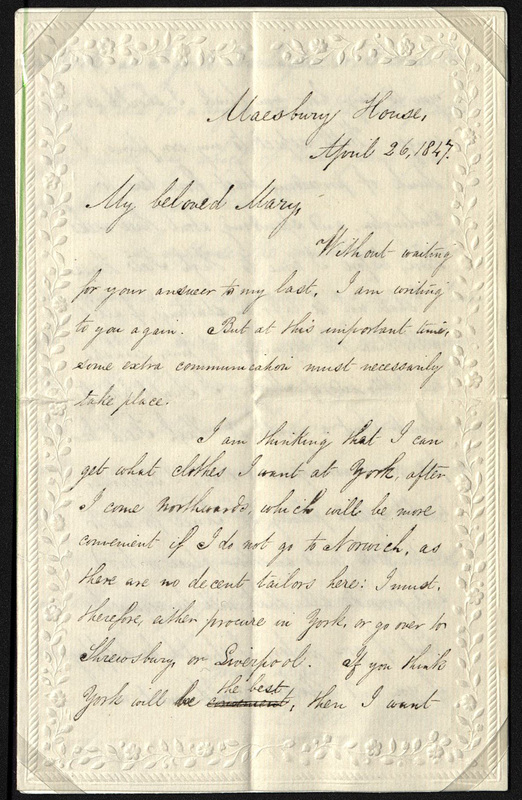 Harry would write to Olive after short periods of separation, sometimes putting pen to paper straight after a meeting. Our research has discovered that while Harry was writing to Olive, they lived just a 15-minute walk away from each other, but he still used illustration and writing to communicate his feelings. What makes Harry’s letters even more special, are his beautiful illustrations. You can see more of these here. Harry was killed in action in France in 1917, just three years after his wedding to Olive. 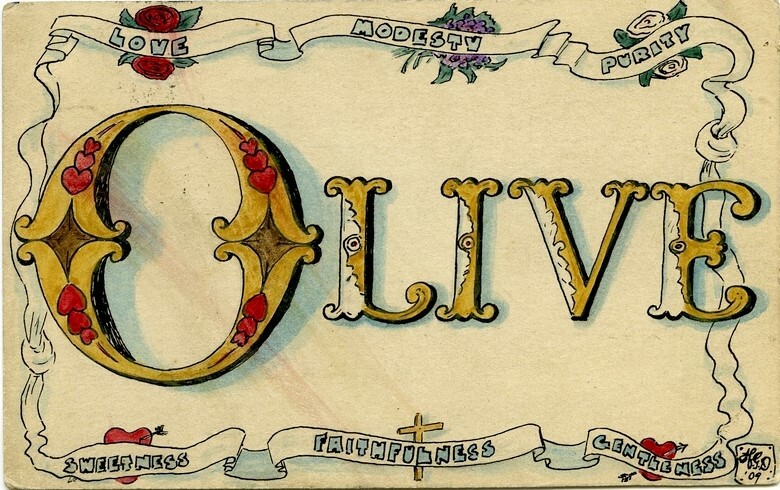 His innocent and carefully made postcards are a testament to Olive and Harry’s relationship. 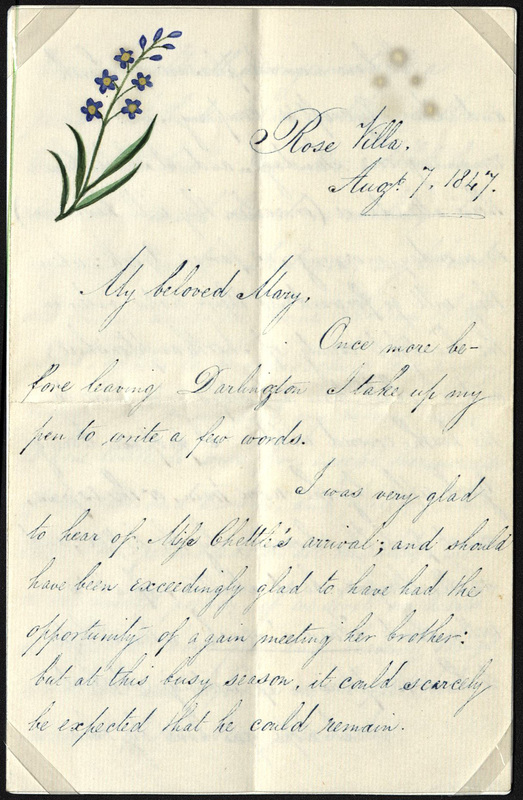 Robert Abbott wrote to his sweetheart, Mary, several times in the mid-19th century. 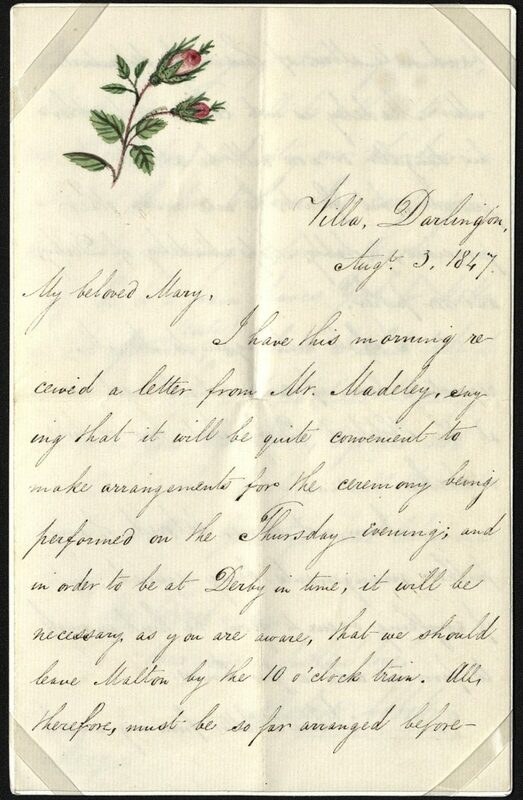 His letters discuss his daily activities but demonstrate how the format of letters allows for romantic sentiment. Robert’s letters are addressed to ‘to my beloved Mary’, and signed ‘yours in unalterable love’. Robert wrote on writing paper decorated with flowers, Victorian symbols of romantic love. My favourite love letter in the collection was written from Ian McLennan to Joan Walker, on the 22 May 1941, shortly after speaking to her on the phone. He describes how he has been ‘pinching myself to see if I am really awake’ after Joan accepted his proposal of marriage. He hopes that the time until his leave passes quickly, ’till we can be together again’. This letter brings together three types of communication: face to face, over the telephone, and in writing, to build a picture of the different ways this couple built their relationship and confirmed their love.